What is the best flooring for a kitchen? Sounds like a loaded question, and it is. Kitchen flooring can be a lot of things, and at RubberFlooringInc we offer a wide variety of floors that will work great in both commercial and residential kitchens. In commercial kitchens, concrete or tile floors are the standard. Both of these kitchen floors are hard to stand on, which makes the need for a high-quality kitchen anti-fatigue mat necessary. In homes, the kitchen best flooring options are ones that are durable, yet slip resistant. 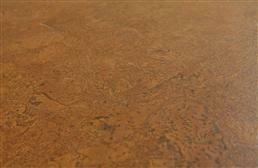 We offer rubber, cork, plastic and vinyl kitchen flooring at discount prices. The kitchen is by far the favorite room in a home. This is where all the magic happens. Think about all the fun stuff that happens in a kitchen: baking with Grandma, making dinner with mom, hosting parties with your spouse. All of this fun is centered around the kitchen. With all of this activity, a quality, durable floor is a must; just like having a chef’s kitchen is a must! For real..it is! 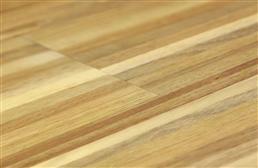 Kitchen flooring comes in a variety of materials, all of which are durable and easy to clean. The materials that we offer for our kitchen flooring are rubber, soft plastic/PVC, vinyl, cork and foam. All of our kitchen flooring is able to withstand heavy traffic, water and grease, and can be installed in a variety of ways. 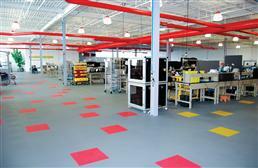 We offer both commercial and residential kitchen flooring and all of our floors are mold and mildew resistant. 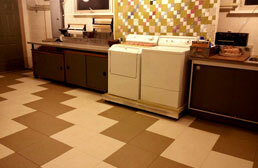 In most commercial kitchens, quarry tile is the required flooring type. This tile is very durable and has a high level of slip resistance compared to standard tile, but these tiles are very hard and are not fun to stand on for long periods of time. 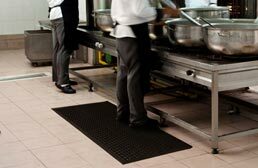 To help alleviate the pressure of standing on these tiles, commercial anti fatigue kitchen mats are used. 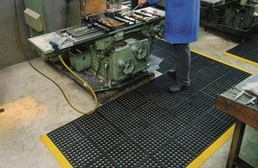 Constructed of rubber, these mats are slip resistant, grease resistant and comfortable under foot. 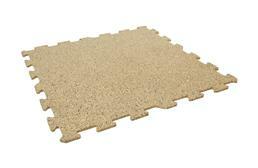 These mats are very easy to clean and maintain and are mold and mildew resistant. All of our kitchen flooring can be used in residential applications. Our residential kitchen flooring offers more visuals in several types of materials. 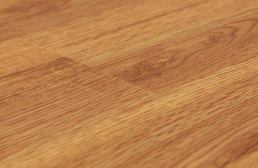 Our kitchen flooring is slip resistant and very easy to clean and maintain. All of our flooring is ‘DIY’ friendly and can be installed in a matter of hours. 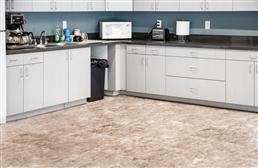 Our residential kitchen flooring is more comfortable than standard tile and is mold and mildew resistant. 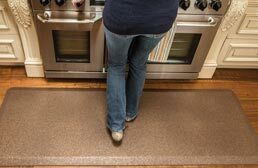 Rubber kitchen flooring comes in both mats and tiles and can be installed in both commercial and residential kitchens. 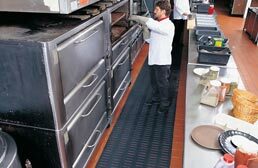 Our rubber mats are the go-to mats for commercial kitchens. 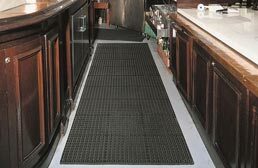 These rubber mats are resistant to grease, oil, and are slip resistant when wet. 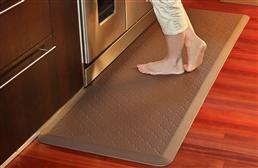 These mats provide a great amount of comfort underfoot and are easy to clean and maintain. Our rubber tiles are designed to be used in residential kitchens. 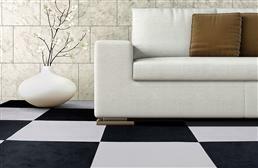 These tiles are very easy to install and are available in a multitude of colors. Rubber tiles are great for residential kitchens because they are slip resistant and mold/mildew resistant. These tiles are easy to clean and maintain and can be easily replaced if one were to become damaged. Our soft plastic/PVC flooring is geared for use in residential kitchens. These kitchen tiles offer the look and feel of real tile without all the hassle. All of our soft plastic kitchen flooring is very easy to install, clean and maintain. 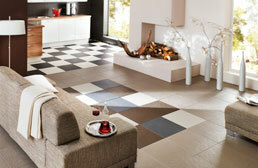 Mold and mildew resistant, these interlocking tiles will add comfort and warmth to any kitchen. 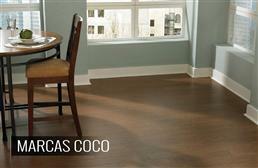 Vinyl flooring is the most common floor used in residential kitchens. Think of the flooring that was in your first apartment. Modern vinyl kitchen flooring provides many great visuals that mimic natural wood, stone and even water. Vinyl sheets, tiles and planks are a go-to floor for kitchens due to their easy installation and low cost. 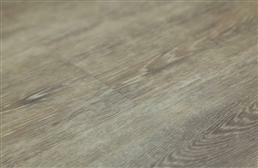 Vinyl flooring is not as slip resistant as other floors, but will provide warmth underfoot. This kitchen flooring is mold and mildew resistant. 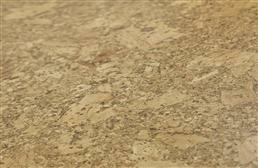 Cork Flooring is a great alternative to natural wood in kitchens. Cork flooring is naturally resistant to mold, water, and mildew which is great for people who like to leave a pool of water by the sink after washing dishes. Easy to install and maintain, this kitchen flooring provides comfort underfoot and warmth. 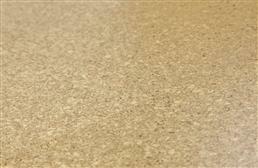 Cork flooring is available in many color and visuals, even ones that look like real wood! All of our foam kitchen floors are mats. 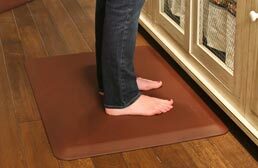 Kitchen anti-fatigue mats for homes are very designer in look and feel, and feature a foam core surrounded by a rubber casing. 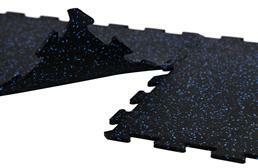 This rubber casing gives the mat added durability and is very slip resistant when wet. The foam core provides superior comfort underfoot while stimulating your circulation while you stand. All of our flooring is great for kitchens, but some flooring is better for areas where lots of water will be present. For areas where copious amounts of water will be on the floor, rubber is the best. Rubber when wet has a higher level of slip resistance than when dry. So if you don’t want to be apart of the ice capades anytime soon, we would suggest purchasing rubber flooring. All of our flooring is great for dry areas. There isn’t anything in a desert that will make you slip, except this one trippy mirage. But that is a story for another time. Enjoy your new kitchen floor!